1.1 While signing the committee's majority report in my capacity as Chair, I and other government members on the committee do not agree with all of the conclusions and recommendations contained in the majority report. This dissenting report broadly outlines the views of government members, where these differ from the views found in the majority report. 1.2 Rolling out the next-generation NBN to all Australians as quickly as possible is a priority for the Coalition Government. But national objectives must always be tempered by economic reality, and tested by thorough public scrutiny. 1.3 In the eight years since the National Broadband Network (NBN) was conceived, there have been a multitude of parliamentary inquiries and hearings to examine NBN Co Limited's (nbn's) performance in delivering on its purpose, as expressed in the Government's Statement of Expectations, to ensure all Australians have access to fast, affordable broadband as soon as possible, and at least cost. Almost all of these reviews have occurred during the term of the Coalition Government. 1.4 On all measures, Bill Morrow and the rest of the executive team at nbn have done a phenomenal job in turning the company around. The NBN is Australia's largest and most complex infrastructure project. It will be a key facilitator for innovation in the nation. In a sense it will be the sinews of the Australian economy in the 21st Century, especially for households and small business. Critical to this is how fast the network can be rolled out, and what prices householders and businesses pay for access to the network. 1.5 When judging nbn's performance it is reasonable to assess the management's record in meeting business plan targets as set out in annual corporate plans, as required of Commonwealth companies by the Public Governance, Performance and Accountability Act 2013. 1.6 nbn's record in meeting or exceeding its financial and rollout targets for three consecutive financial years stems from the Coalition Government's reforms which gave nbn the flexibility to choose the right broadband technology for each location. This approach aims to reduce costs, save time and limit inconvenience to households and businesses during the transition to the new network. 1.7 Under the Coalition Government, this important infrastructure project is continuing at a more manageable cost and is on track to deliver all households access to better broadband by 2020. An important point is that someone must in the end pay for the network. This means that if the cost of the network increases, the increase must either be paid for by consumers through higher retail prices, or tax payers through more funding. Figure 1 represents the difference in financial profiles between the MTM approach and the all-FTTP approach. 1.8 The committee majority report implies at several points that there is a risk nbn will fall short of the Statement of Expectations regarding the speed of services provided to the fixed line footprint. 1.9 In fact, elsewhere in public statements, responses to Questions on Notice and evidence presented to parliamentary committees, nbn has indicated that the average speed attainable on nbn's fibre to the node (FTTN) network is 67.7 megabits per second (Mbps) and 101.6 Mbps on the fibre to the basement (FTTB) network. The average attainable rate across both networks is 70.4 Mbps (page 101). 1.10 While the network speed baseline is nominally set at the universal minimum 25 Mbps, at least 9 in 10 premises in the fixed line footprint will have wholesale speeds of at least 50 Mbps at rollout completion under the direction set by the Statement of Expectations. Furthermore, an upgrade path will provide close to half of all premises on the network access to speeds of up to 500 Mbps as demand emerges. 1.11 Paragraph 1.28 of the committee majority report also misrepresents the findings and purpose of the 2013 NBN Strategic Review. The objectives of the review were to assess the progress and cost of the rollout at that time, as well as the economic viability of nbn under alternative rollout scenarios. The Strategic Review also evaluated the likely operational and financial position of nbn based on the continuation of the fibre-to-the-premises rollout targeting 93 per cent of premises. 1.12 The strategic direction recommended by the review was that NBN Co should develop an 'optimised multi-technology approach' to rollout out the network that balanced fast broadband deployment to the highest number of Australians with better economics. 1.13 Far from being an outlier, nbn's 'incremental upgrade' approach has been adopted in other countries such as Austria, Germany and the UK, to enable further investment to be staged as demand emerges, in parallel with technology advances. 1.14 By mid-2017 nbn had exceeded its rollout targets and financial forecasts across three full financial years. The cost overruns and connection delays that plagued the early rollout under the former Labor Government have been resolved. 1.15 Over little more than three years, the number of premises able to access the NBN network has grown from 504,000 premises reached, to more than six million in the NBN's national footprint. Similarly, customers connected to the built network stood at 51,000 in September 2013. In September 2017 there are more than 2.8 million services in operation and nbn's wholesale revenues have exceeded $1 billion annually and continue to grow. 1.16 Figure 2 demonstrates the rapid rollout since switching to an MTM model. 1.17 nbn's Corporate Plan 2018-21, released in August 2017, shows the NBN rollout remains firmly on track to deliver fast broadband to all Australian homes and businesses by its target of 2020, having achieved two consecutive years during which the network footprint was nearly doubled. 1.18 The plan will see three-quarters of Australian premises able to access a service over the nbn network by mid-2018, with 4.4 million active services by that time. These forecasts are in line with targets the company set more than two years ago. 1.19 The Corporate Plan reports that network construction and activation is nearing peak with more than 6,000 direct nbn employees and an external field workforce of 24,000 contractors working to build the network and connect homes and businesses across every square kilometre of Australia. 1.20 Capital expenditure reached $5.8 billion in FY2017. More than 70 per cent of nbn's procurement spend to date has been on local content – that is, Australian manufacturing, construction, installation and support activities. 1.21 End-user activations were higher than forecast in 2016-17 and the NBN is now being switched on at 1,000 Australian premises every working hour. There are more than five times as many users on the network today compared to just two years ago. trialled speeds up to 100 Mbps delivered over the fixed wireless service. 1.23 That nbn has been given the flexibility to choose the best technology for each part of Australia is the very reason that these upgrades have been possible, in contrast to the technological ideology of the previous Government. 1.24 Of course, even though these factors were brought to the committee's attention, nonetheless the committee majority has formed the view that upgrades across the nbn network are required (although not costed). In paragraph 2.88 the committee majority appears ignorant of the costs of wholesale upgrade, and in paragraph 2.89 appears to confuse speed with capacity. 1.25 As figure 3 clearly shows, most user applications require far less speed than what will be delivered over the NBN. The reality is that, aside from a few niche products (that are largely focused on video streaming and related entertainment applications) there are currently few products or applications that require speeds higher than 25 Mbps. It is the case that under current technology specifications (including compression technology) multiple ultra high definition video streams might require speeds of 75 Mbps or more (on the basis that households have access to ultra high definition televisions and content), although it is questionable whether the Australian taxpayer should be subsidising such uses. 1.26 The argument cited at paragraph 2.81 of the committee majority report, that Australia has been dropping in internet speeds, fundamentally misunderstands the Akamai index upon which those claims are based. Akamai measures the total speed achieved or requested though its global services (i.e. demand, not supply). Consequently, countries with high concentrations of a small number of high usage consumers achieve a relatively higher ranking. 1.27 The strength of the Government's rollout is affordability and ubiquity – all Australians, regardless of where they live, will have access to high speed broadband of 25 Mbps or more by 2020, at affordable prices. Demand for speed in Australia is also depressed compared to some other countries because of the compression technologies being used (the ABC, for example, asks that users have an internet speed of 1.5 Mbps or more for best results). 1.28 Ironically, an all FTTP rollout would have meant a lower ranking for longer because of the much slower pace of the rollout and consequent delayed switch over from slower ADSL-based broadband. 1.29 The estimated peak funding is forecast to reach $48.8 billion in financial year 2020. This remains unchanged from nbn's forecast in the two previous corporate plans. nbn forecasts that its revenue will almost double in the coming financial year, from $1 billion in 2016-17 to $1.9 billion in 2017-18. The internal rate of return for the project is forecast to be within the range of 3.2 to 3.7 per cent based on peak funding of approximately $49 billion and a terminal value calculated at six times EBITDA. 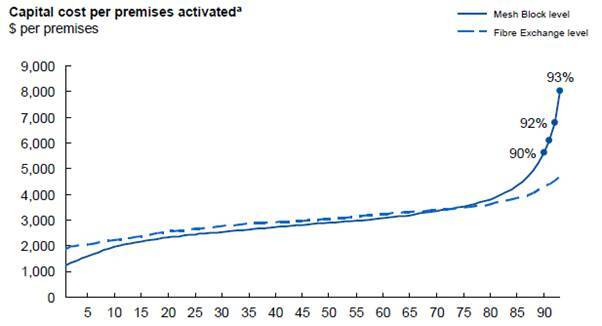 1.30 At the end of each of the last three financial years, nbn's activations have been ahead of forecast. Further, nbn's public statements on take-up rates by the end of the 18-month migration period—and 2018 Corporate Plan forecasts of RFS and activations—suggest the proportion of activated services at the end of FY2021 will be 73.5 per cent, across all technologies. 1.31 The committee majority report at paragraphs 2.17 and 2.6 suggests there is doubt around nbn's take-up forecast because the proportion of services activated is currently less than 70 per cent. However, the clear trend from service activation rates over the past three years indicates nbn's forecasts have been on the conservative side. A closer analysis of the data would reveal that the proportion of premises in serving area modules that are live increases as time goes on. It is obvious that the activation rates will lag the ready for service progress because nbn has been expanding the network footprint at a faster rate than the connection runrate. For example, in FY2018 nbn plans to deliver nbn access to a further three million premises but during the same period the company will connect two million premises. Therefore the proportion of connected premises in the total footprint in a year's time will remain relatively steady at 50 per cent. 1.32 The Statement of Expectations which sets the overarching objectives and direction for nbn makes explicit the requirement for nbn to design and build the network with upgrade paths available for future development. On several occasions and in various forums, including hearings of this committee, nbn has confirmed that the multi-technology mix is delivering an upgrade path for FTTN and its variants, as well as HFC. [T]he typical way you do long-term planning is...apply parameters of CPI for both revenue and costs and we apply a ratio of CAPEX to revenue, which, in our case, are around about 15 per cent. It is true some of that 15 per cent could be applied to upgrades, but...it's not locked in... So what we would do is we would look at business cases for upgrades as and when they come and we would apply capital where it made business sense to do so. There would be an overlay, if you like, to our corporate plan, and you would only do it when it improved the corporate plan. The committee majority report conclusion of paragraph 2.90 is at odds with the usage patterns, speed tier take-up, and choice of plan indicated in Table 2.4 of the same report. 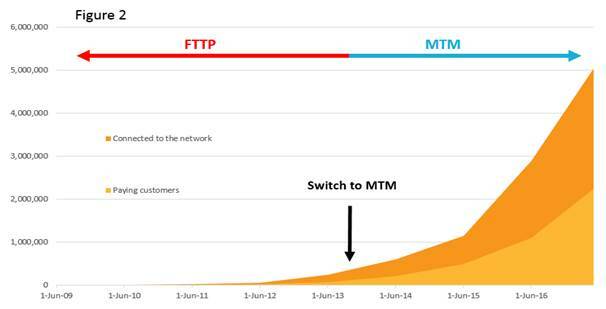 Relying on a sample size of 2.8 million connected customers, the speed tier data indicates the prevalent trend is for users to move from the lowest tier (12/1) to the next highest tier (25/5). The proportion of users selecting a speed tier of 50 mbps or more has remained largely unchanged during the past two years. 1.34 Describing the Sky Muster service as a 'technology of last resort' (committee majority report paragraph 4.87) significantly undervalues the step-change that has occurred in the experience of internet users living in regional and remote areas. 1.35 The Australian Government has invested $2 billion in two advanced Ka-band satellites and a network of ground stations that make up the Sky Muster service. 1.36 Until the Sky Muster service became available many homes and businesses in regional and rural Australia were still dependent on very basic internet access which made even online banking or emailing difficult. Sky Muster has change all that for many thousands of Australians. 1.37 As the committee majority report acknowledges, satellite has always been intended to be part of the rollout. Indeed, since the beginning of the rollout, satellite has been used to provide broadband to Australians living in regional and remote areas. nbn first began providing satellite services through the Interim Satellite Service (ISS). Spending approximately $351 million, the then Labor Government had promised 250,000 Australians would be eligible but capacity was only available for 48,000. The service was abysmal, with speeds often no faster than dial up. Part of this stemmed from poor design – the lack of an enforced fair use policy meant that some heavy use consumers were able to consume more than their fair share of data, whilst thousands of normal users could not get an adequate service. 1.38 Under the current Government, the nbn has a record of being able to deliver satellite to some of the most remote parts of the world, and deliver upgrades along the way. 1.39 The Fixed Wireless and Satellite review undertaken by nbn under the Coalition Government was able to diagnose some of the systemic issues that plagued the ISS at the time. In 2014, nbn upgraded the capacity of the ISS by one third, at a cost of $18.4 million. Secondly, a fair use policy was introduced to ensure that a minority of very heavy users could not crowd out the majority. 1.40 Following the work undertaken in the Fixed Wireless and Satellite Review, both satellites were launched successfully into orbit by nbn, and have begun providing services. Whilst there have been some initial problems in installation and stability, nbn has now resolved these issues, and the reliability of Sky Muster has been consistent with other technologies on the network for some months. At the same time, the rollout of Sky Muster services has been proceeding at a rapid pace, with over 79,000 active customers now using the service. 1.41 Last year, telecommunications research firm Ovum found that when measured in terms of data allowance, download speed, upload speed and affordability selected plans on the nbn Sky Muster service are world leading for satellite broadband services. 1.42 Ovum examined eighteen retail service providers internationally that offer satellite broadband services and found that selected plans based on nbn's Sky Muster service delivered outstanding results across all service requirements, establishing itself as a world leader that will deliver a great service for regional and remote Australians. 1.43 Notwithstanding the substantial achievement in launching two of the most sophisticated telecommunications satellites to provide services to some of the most remote places in the world, nbn has also delivered a series of upgrades to the service, over and above what they were originally designed to do under the former Government. In particular, nbn has been able to fully utilise the second satellite to provide services, rather than leaving it for redundancy. Secondly, through more sophisticated demand modelling, nbn has been able to adjust upwards the fair use policy to enable nbn to provide an extra 50 per cent of data during peak times, and double the data available at off peak time, whilst still ensuring that all users are able to get an adequate service. It is clear that less data would have been available under the former Government as it had only planned to make use of one satellite. Due to its revised forecasts of Sky Muster capacity and through optimising the conversion of available satellite spectrum (megahertz) to usable bandwidth (megabits), nbn has been able to increase data caps from 150GB to 300GB, or from an average of 30GB of peak data per customer to an average of 45GB of peak data per customer. 1.44 The committee majority report focuses on limited and at times, misleading comparisons between rollouts in other countries. In particular, to compare the rollout of broadband in New Zealand with the rollout in Australia fundamentally misunderstands the basic geographies of the two different countries, and the economics of each rollout. 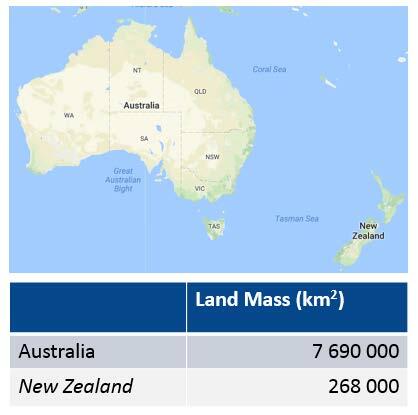 1.45 Figure 4 seeks to demonstrate the difference in land mass size between Australia and New Zealand. Put simply, Australia is more than 27 times larger than New Zealand. 1.46 Furthermore, there are important facts about the New Zealand rollout that the committee majority has not acknowledged. In particular, there is no commitment in New Zealand for 100 per cent coverage – premises can be chosen on the basis of how easy or profitable it is to rollout services to them. Source: National Broadband Network Implementation Study, May 2010, p. 14. 1.48 With the continuation of the rollout, these forecasts have proved overly optimistic, as nbn has gained experience in a real-world environment, and not the theoretical model of consultants. 1.49 New Zealand has not needed to make use of satellite technology in its rollout and is able to rely on terrestrial wireless and mobile technologies for providing services beyond the fixed line footprint. 1.50 For Australia, satellite has been necessary as this is the most cost effective technology to serve remote premises to ensure that all premises can access minimum broadband speeds of 25 Mbps. 1.51 nbn is expected to spend around $4.5 billion in capital on the fixed wireless and satellite networks to provide affordable broadband to regional, rural and remote Australia. Of course, the Government has done this because it believes that there must be equivalent broadband services in regional Australia. This commitment is demonstrated by the Government’s regular reviews of regional telecommunications via the Regional Telecommunications Independent Review Committee (RTIRC). 1.52 The new broadband networks being rolled out in Australia and New Zealand are vastly different and it does neither rollout justice to compare them using simple metrics such as the cost per premises to build FTTP. The fixed line footprint in Australia will extend to around 92 per cent of premises, whereas the fibre rollout is only around 85 per cent in New Zealand. The minimum broadband speed being provided in Australia is 25 Mbps, whereas New Zealand is only guaranteeing 10 Mbps. 1.54 And while the committee majority report at paragraph 2.82 suggests the ACT Government found Australia compared unfavourably to South Korea and Hong Kong which have rolled out FTTP networks, there is no acknowledgement of evidence given at two hearings that demonstrated that the beneficiaries of FTTP are unwilling to pay the incremental costs of upgrade. Both the ACT Government and the South Australian Government expressed a desire for FTTP to be rolled out in those States. When asked whether they would be will to contribute to the cost, these jurisdictions declined. This is a real world example of the willingness to pay for FTTP over MTM – when asked whether they would contribute to the sometimes substantial costs of using FTTP over MTM, both jurisdictions declined even though the supposed benefits would largely accrue in their jurisdictions. 1.55 The reality is that access to high speed broadband (regardless of the technology) is just one factor to determine whether the economic and social benefits flow from access to high speed broadband. For example, Tasmania has the highest proportion of FTTP of any state, and has had access to the network the earliest. Nonetheless, Tasmania ranks the lowest on Telstra's Digital Inclusion index compared to other States. 14 September 2017: Total percentage of brownfields premises at SC0: 5.9 per cent. 9 September 2013 (at time of 2013 election): Total percentage of brownfields premises at SC0: 31 per cent. 1.57 The committee majority report at paragraph 1.50 refers to research undertaken by the Australian Communications and Media Authority (ACMA) in 2016 and implies the research found that very early and high migration rates were a feature of the FTTP footprint. In fact, the ACMA research found that, of 900 premises in FTTP ready for service areas, 400 (or 44 per cent) had not switched over to the NBN at all at the time the survey was undertaken. setting out the roles and responsibilities of all parties in delivering a smooth transition to an NBN-based service through a revised telecommunications industry guide. 1.59 In addition, the ACCC has released detailed guidance for retailers on how to advertise broadband speeds to customers, including clearly identifying typical minimum speeds during peak periods. 1.60 The committee majority report finds that these measures are untimely or inadequate, despite most of them being at just the earliest stage of implementation. For example, paragraph 5.62 declares the committee's view that industry guidance from the ACCC will be insufficient and heavy regulatory intervention is required. 1.61 The ACCC is to be applauded for taking the measured and prudent approach of developing comprehensive industry guidance on the information to be provided to consumers about broadband services supplied over the NBN. While great progress has been made in the rollout of the NBN over the past several years, it remains a fact that the majority of residential broadband connections still operate over pre-NBN infrastructure. The telecommunications sector is undergoing a period of adjustment as the nbn progressively replaces legacy broadband infrastructure. Broadband consumers do need more detailed information concerning the new choices available to them in the post-nbn world. The ACCC's guidance is well researched and informed by typical usage and user needs. Given the guidance has only been provided to retailers in recent weeks—and there remain more than five million Australian premises to be migrated to the nbn—it would appear premature to be declaring that the guidance will be inadequate.